Slik Helvetika is a celebrated 28 years of blistering high energy melodic metal. The band has stayed true to its founding philosophy: We should only make music we love and our records need to stand tall against our all time favorite records of all time. 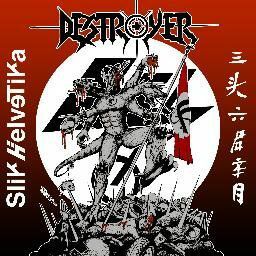 The band hails from Pennsylvania with roots stretching from the early 1980s when the band was called DESTROYER. The history spans all the way back to the legendary Empire Rock room in Phila which spawned the superstar Cinderellas and Britny foxes of the 80s and includes many former members such as Kjell Benner from Quiet Riot and Skull, Mark Bennet from Mindmaze and current members Vern Parsons from Howe 2 and Chris Metzger of Sinister Realm and Type 14.